The commander of Iraq's Badr militia says that Iran's top officer provides assistance in Iraq "whenever we need him". Qassem Soleimani, Iran's top officer responsible for foreign operations, provides assistance in Iraq "whenever we need him," Hadi al-Ameri, the commander of the Badr militia, said on Sunday. "He was giving very good advice. 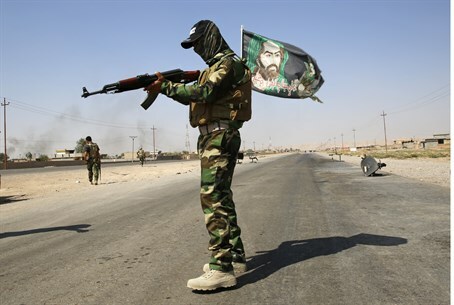 The battle ended now, and he returned to his operations headquarters," Ameri told journalists close to the Al-Alam area north of Baghdad, according to the AFP news agency. He was apparently referring to the battle to retake the nearby city of Tikrit from the Islamic State (ISIS) jihadist group, which began earlier this month and has since become a siege. "Qassem Soleimani is here whenever we need him," said Ameri, whose Badr militia is a powerful Iranian-backed force in the fight against ISIS. Ameri's remarks are a sign of the important role Soleimani plays in military operations against ISIS in Iraq and the influence Tehran wields in Iraq, both much to Washington's chagrin. Soleimani has advised Iraqi forces in multiple operations against ISIS, which led a major offensive last June that overran large areas north and west of Baghdad. In doing so, he and other Iranian advisers provide the kind of forward support during operations that U.S. President Barack Obama has yet to authorize American forces to undertake. Soleimani has played an increasingly public and open role in the fight against ISIS, a major change for a man who was once known as the elusive operative leading Iranian efforts against the United States in Iraq. Now, his face is widely known, pictures of him are shared on social media, and he has even been the topic of music videos, noted AFP. Iran has been involved in the fight against ISIS before, having bombed the group’s jihadists in eastern Iraq in late 2014, an attack which the Pentagon clarified was not coordinated with the United States. On Friday, former CIA head General David Petraeus warned that Iran is a greater danger than ISIS in Iraq. He was preceded by Secretary of Defense Ashton Carter, who said earlier this month that the presence of Iranian advisers in the Iraq battle for Tikrit is "concerning" to the United States.